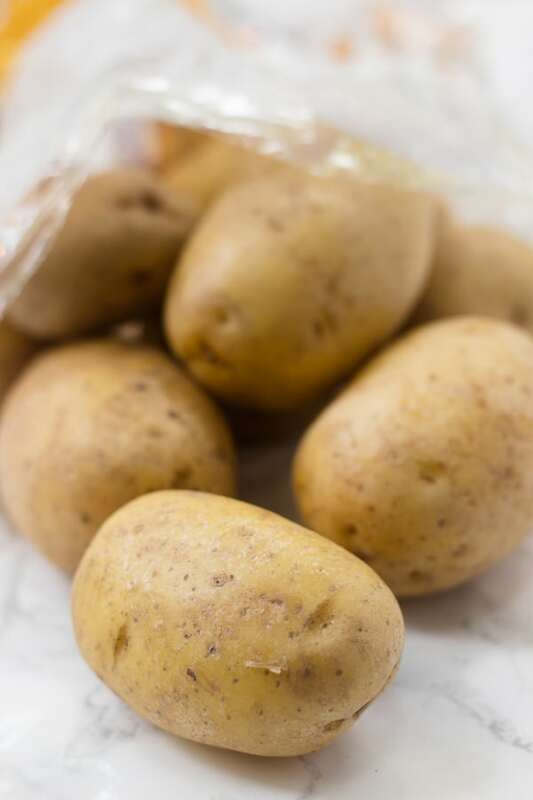 Since I started working on this recipe post, I’ve done some strange things…like texting my sister four nearly-identical photos of uncooked potatoes that I took and asking what photo I should use. And eating roasted potato salad as a side with fajitas (not burgers or something that would make sense). And then Googling a lot of really specific potato questions like, “What’s the difference between purple and blue potatoes?” (Answer: there’s not really one). Life of a food blogger, I guess. But I’ve learned a lot of interesting things about potatoes as I’ve been working with Potatoes USA! Like there are more than 200 varieties of potatoes sold throughout the United States. And then each of these varieties fit into one of seven potato categories: russet, red, white, yellow, blue/purple, fingerling and petite. As you may know, each type is ideal for different things. For example, russet potatoes have thick, dark brown skin and a high starch, low moisture content, which makes them perfect for baking, mashing, and making french fries. They’re not great for cubing and boiling for potato salad, though, because they’ll fall apart. 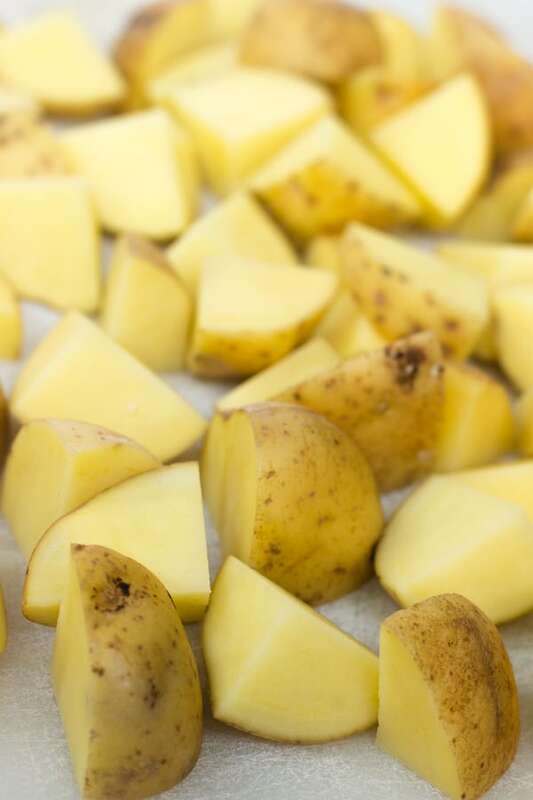 On the other hand, yellow and red potatoes are awesome for boiling, steaming, and roasting. They’re perfect for potato salad, as they hold their shape well. I love all potatoes since they’re so convenient and inexpensive, but yellow and red potatoes are extra convenient since they have a thin skin that you’ll never need to peel. 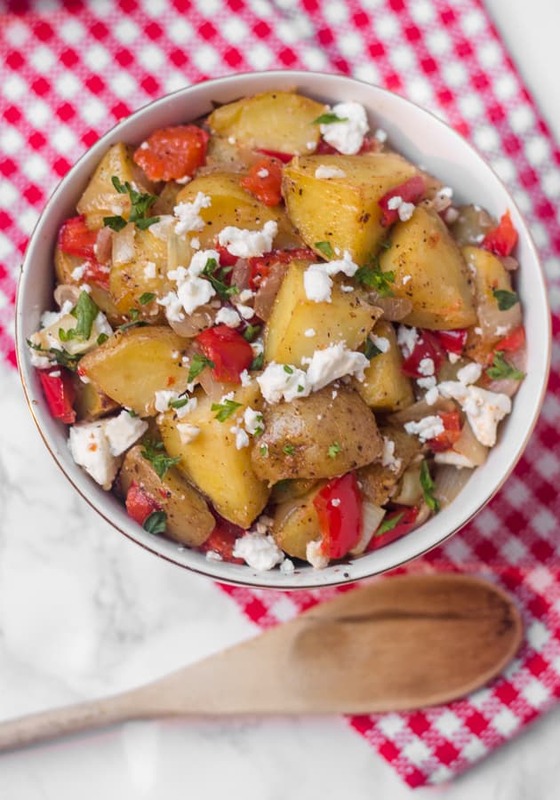 For this warm roasted potato salad recipe, I used yellow potatoes rather than red because I particularly love their rich flavor and creamy texture. I wanted to come up with my own potato salad recipe, but as part of team-no-mayo-for-life-o, traditional potato salad makes me shudder. I love roasted potatoes, so I came up with this warm roasted potato salad with a light olive oil and lemon dressing. Potatoes are like a blank canvas of possibilities since they really take on the flavor of their seasonings. 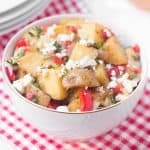 In this roasted potato salad, there’s some sweetness from the roasted red peppers, zestiness from the lemon, and a little bit of saltiness from the feta. It’s the perfect mix of flavors. You could also add olives, spinach, other fresh herbs, but I wouldn’t take out a thing. You could sub goat cheese for the feta if that’s your favorite, or add jarred roasted red peppers at the end instead of using fresh. And finally, making this is super simple with just a few steps: First, you’ll prep the potatoes by scrubbing them clean. Then, halve them lengthwise and cut each half into four additional cubes. Chop the red pepper and onion, and then add all of the veggies to the baking sheet. Add a few raw cloves of peeled garlic on top and then drizzle everything with cooking oil (I use avocado oil), salt, and pepper. Cook until potatoes are soft on the inside and crispy on the outside. Then, you’ll mash up the garlic cloves into roasted garlic paste (so delicious), then add a squeeze of fresh lemon juice. The cooking oil, roasted garlic paste, and fresh lemon juice create the best dressing for the salad! Add a generous spoonful of feta and some fresh parsley, if you’d like. And it’s ready to go. If you try this warm roasted potato salad, feel free to take a picture and tag me @livbane on Instagram or let me know in a comment! For more potato recipes and ideas, check out the Potato Goodness Facebook page. Preheat oven to 400°F. Wash and scrub potatoes, and then dry. Cut each potato into eighths (or more for large potatoes). Line baking sheet with parchment paper. Place potatoes on baking sheet, and add chopped pepper and onion. Drizzle with olive oil and toss with salt and pepper. Add whole peeled garlic cloves on top of potatoes. Bake for 60-70 minutes, until potatoes are soft and starting to crisp. Remove from oven. Using the back of a fork, mash roasted garlic cloves into a paste. 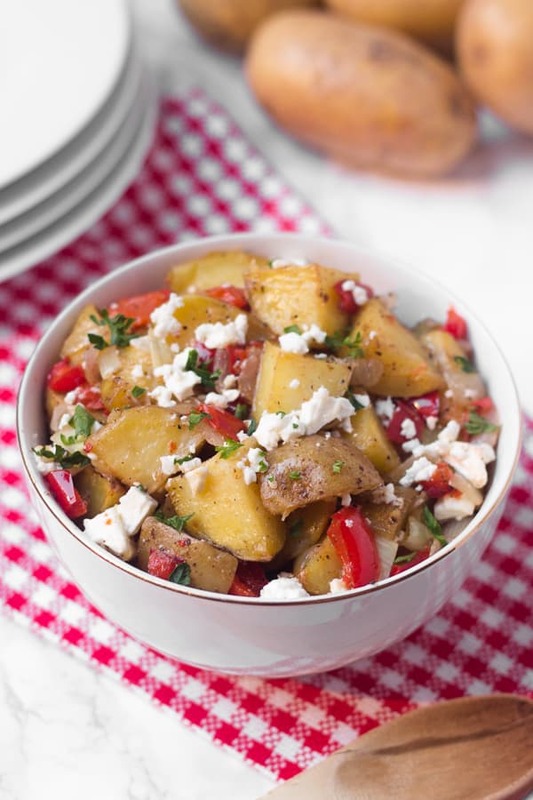 Squeeze lemon juice over potatoes and add feta cheese. Add fresh parsley, if using. Toss potato salad together and transfer into a medium serving bowl and enjoy while warm. What a lovely description of potato salad; I now have a new appreciation for the wondrous gift of potatoes. It’s so cool how God created so much variety even into just one vegetable. I had no idea there were that many varieties in the US. I love them though because they are such a starchy carby delicious comforting vegetable. And I love that you did mayo free (not because I never like mayo), but I actually prefer potato salad without mayo. Thanks, Emily! I agree, potaotes really are awesome- so versatile, easy to make, inexpensive, and delicious! This looks like the best potato salad I have ever seen. How about a taste at Thanksgiving? You made some really interesting comments about potatoes! Thanks, Gee! I’d love to make it for you when you come visit over Thanksgiving break! Maybe the World’s best potato salad! What a gorgeous looking dish! I bet it tastes even better though! Thanks, Kristy! It was delish! Great salad, thanks for sharing! So glad you liked it, Lily! Wow. This one really looks amazing. I will definitely make sure to try that and I think, that I will often come back to this recipe 🙂 Thanks! Thanks, Brian! Hope you enjoy it! Sheila, I’m so happy to hear that you enjoyed this potato salad!!! It’s my favorite, as well. Thanks for reporting back! Ooohh… My boyfriend loves all things bacon. I am definitely going to try this. All of these salads look great. Just in time for summer picnics! Hope you love this potato salad!! I’m so glad you enjoyed this! !